Erosion Control Straw Matt for sale in Beltsville, MD. Beltsville Construction Supply Inc. Erosion Control Blankets are thick, fibrous blankets woven out of either natural materials (e.g. 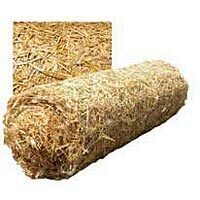 straw and coconut fiber), synthetic materials (e.g. polypropylene) or a mixture of natural and synthetic materials. These blankets are used primarily to slow water runoff, provide effective sediment and erosion control, and enhance re-vegetation. These blankets are commonly applied to channel and ditch linings, slopes, culvert inlets and outfalls, riverbanks, and levees. Erosion control blankets are classified as short term, long term, or permanent use, mostly based on whether vegetation is intended to replace or work in conjunction with the blankets.